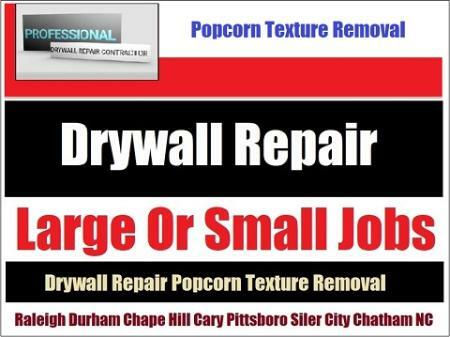 Call Drywall Specialist for hanging, finishing or popcorn texture removal work in Chatham County? A skilled expert with years of repair, renovation and ceiling texture extraction experience. Affordable prices and free estimates on large or small. Chatham County NC: 27207	Bear Creek. 27208	Bennett. 27213 Bonlee. 27228	Bynum. 27252	Goldston. 27256	Gulf. 27312	Pittsboro. 27344	Siler City. 27559	Moncure. Based In Siler City And Servicing The Entire Catham County, NC Area!. Drywall Specialist Copyright 2019 All Rights Reserved 919-742-2030 Drywall Specialist 84 Pear Drive Siler City NC 27344.